Russ Reising: One thing I'm doing with this project is interviewing people from many areas of life, not merely the arts or psychedelic celebrities like Ken Kesey. What I'm interested in is finding out how whatever they are into, whoever and whereever they are, psychedelics have played a significant role in their lives. I heard your talk yesterday, experienced a lot of your work, and I feel I've already been transformed by your painting and video work. Alex, please let's begin with whatever version of your psychedelic history you feel important. 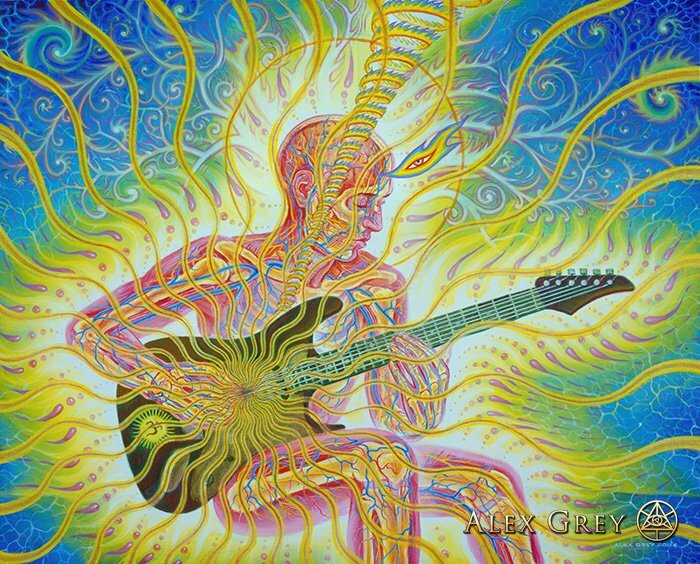 Alex Grey: I think that the first time I heard of LSD I was back in 7th grade however old that is. Russ: Twelve or thirteen; I know because I've got twins in the 7th grade. Alex: I read about LSD in Life magazine and in some of the other major magazines of the era. It was not given a negative spin at all in those days. There were pictures of the hippies and Alan Ginsburg in their happy mode, and shots of Leary in his guru mode. It all looked really cool. LSD was still legal, and there was nothing bad about it; it just looked really cool. They tried to describe the distortions and weird things that would happen to the mind, and it sounded very exciting. I did a seventh grade science report on LSD-25. I hadn't taken it, but I was very intrigued. Not too long after that, I fell into a chronic adolescent depression, and some of my friends were listening to Hendrix and the Beatles and taking acid. Some of them, because of their backgrounds and not really knowing what acid was about, got pretty freaked out. I was, I guess, the straight man for them. I didn't take it during that time because I was afraid it might make my depression worse. It might have been a great thing for me to do, but there were no "experienced guides" nearby and I was pretty scared. 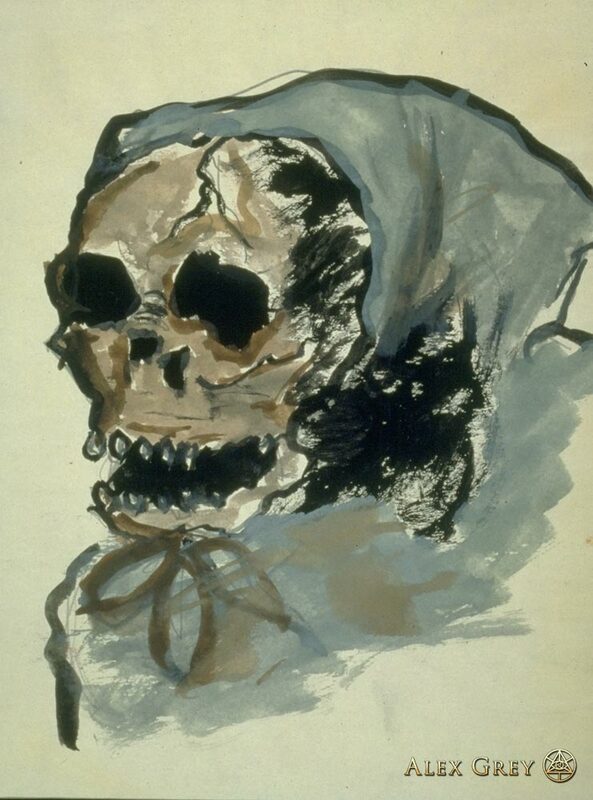 In my late teens I began doing art work with a visionary basis, but the paintings were morbid nightmare visions. I think there's a kind of adolescent alchemical phase in human development -- a dangerous age from 15 to 21, where you'll either kill yourself or sell yourself out or actually find something worth doing with your life. It was during that sorting out period, fueled by existentialist philosophy, when I became more convinced of the absurdity of existence and the meaninglessness of it all. I had great respect for Nietzsche and his passionate disregard of authority. It fit the mood of the Viet Nam War era. The youth of America had come to distrust their parents and any kind of mainstream authority figure. I hadn't encountered the mystical philosophers yet, and heard that Schopenhaur was even more pessimistic than Nietzsche, so I stayed away from him. (Now I love and recommend Schopenhauer's writing about art.) My philosophical studies set me on the path of doing weird performances, cutting off half my hair, throwing up on brains, spending all my money on a trip to the north magnetic pole. Upon my return, bereft of all my money, I was convinced that I was "searching for something." Exhausted, dazed and confused, I was still making art. A thought creeped into my mind: "OK, maybe I'm searching for "God," whatever that means..." My interest in God was piqued when I was about ten and my parents suddenly left the church and turned atheistic but I hadn't actively pursued that interest. Russ: How do you spell "God," the way you say it! Alex: G A W D, I don't know. It was the end of the school year when I came back from the Polar Wandering performance. At school I ran into an acquaintance who invited a professor and me to a party later on that evening. The professor picked me up for the party with a bottle of Kahlua into which, he told me, he had dropped a few hits of LSD! Feeling a little more fearless, after doing my strange performances and feeling there was nothing to lose, I took the bottle and drank about half of it. At the party the acquaintance who had invited me, asked what was in the bottle. I told her and the two of us shared the bottle. I felt a little woozy and started to have my first psychedelic experience. Remarkably, my vision during the entire experience was focused on one image. I saw a spiralic, helical tunnel that started in the dark and was going toward the light. It was a living mother of pearl color, opalescent in the best entheogenic sense. All of my artwork had been about polarities that year, and my consciousness was "in the dark and going toward the light" in this tunnel. It felt like a universal symbol of the interconnectedness of opposites. Not really understanding or knowing anything about mysticism, this was my homegrown spiritual awakening, a spiritual re-birth canal. It was very positive, very unifying. The next day I called the friend who had shared the bottle with me to ask "how was it for you." She said it had been great, although she had tripped plenty of times. I asked if we could get together that night. We got together and have been together ever since, about 25 years. Russ: You know, Tom Robbins and I were sitting at your talk yesterday, and I leaned over and said, "You know, I really like the looks of this guy; he really seems to have suffered and to have come through in powerful ways." I'm wondering how your psychedelic experiences have transformed, redeemed, deepened, whatever, your own sense of suffering and your prior self-defined morbidity of interests. Was it a therapeutic, redemptive, distillation; how has psychedelia interacted with that phase of your development? Alex: Well, I point to LSD as having been the catalyst and direct provocation of my first mystical and spiritual experiences. My orientation was not inclined toward accepting consciousness as something that could exist apart from the body. I had more or less accepted a materialist and reductionist view. I hadn't had any experiences to counter that belief. Going through this transpersonal spiralic tunnel inside my head was convincingly real. This intense experience of meaning was knowledge that transcended words. It allowed me to relax philosophically in the way that Terence McKenna characterizes as "It's all all right." The metaphysical unity and peace that transcends existential mental anguish can be one of the primary benefits of the substances. The greatest transformative potential for entheogens is to bring mass consciousness toward Spirit, toward infinite love and awareness of the sacredness of life. I mention psychedelics whenever I do a talk on my art work, because my life and art have been directly and positively impacted. Once you have a profound mystical experience, your entire life can be guided by the truth that you experience. It's no longer a matter of belief in God or belief in spirituality. You've had an experience you can refer back to that becomes a reference point for future development. Many friends have become involved in the Santo Daime church with its somewhat more formalized approach and the sacred context provided for the substances. Allyson and I have stayed more oriented toward our own personal, non-community type experiences though we did participate in some sessions where a number of strangers would congregate and bring their own substances. Some paricipants would laugh all night, some barfed all night, and some got naked and crawled all over each other. It was a wild and wacky experience. Russ: Wow! That's my kind of communion. Forget about the body and blood of Christ; just give me some of that action! Interesting talk about the sacred. It seems to me that Robert Venosa has spent much of his artistic career struggling to recapture what he described as a nano-second vision of an angel during his first trip. In his discussion, he seemed very comfortable using a traditional Christian frame of reference. Expanded, to be sure, by many references to Hindu avatars, Buddhist deities, and other religious figurations, but he returned repeatedly to conventional Christian terminology. Your own work is very eclectic, but my guess is that you would be less comfortable remaining within a traditional Christian frame of reference. Alex: It depends on what you mean by traditional. The Christians have a pretty broad spectrum of attitudes, from the mysticism of Meister Eckhart and Jacob Boehme to the fundamentalists that believe in literal interpretations of the Bible. Russ: Your sense, seems to be more what I associate with the psychedelic community in general, more an all inclusive, Jungian sense of the spirituality, avatars, and iconography of all religious systems contributing and constituting a vocabulary rather than a frame of reference. Or maybe it's a vocabulary that enables us to envision a new frame of reference? Alex: All spiritual traditions are fingers pointing to the moon and can be used to access the transcendent. Any of them can be effective. That's one of the most threatening points of psychedelic art, that it can be so inclusive. It is seen as heretical by its very inclusiveness. There is a lot of resistance to acknowledging the perspective of all the traditional approaches from shamanic through UFO religions. If you're that eclectic, it is perceived that you don't believe in anything. The psychedelic perspective is an orientation toward spiritual reality and a respect for the inclination in human consciusness to manifest in all kinds of unusual and amazing ways. I've heard of people who had profound, distinctively Christian conversion experiences during their psychedelic experiences. Russ: I wonder if it isn't very different for somebody to "say," or to talk about their religion in very eclectic terms, say of the Bahai faith of some other such omnibus sect, however, I think the difference that we are looking at here is the power of the visual image and its ability to threaten people by virtue of its apparent heretical nature. It's one thing to say that you're inclusive; it's quite another to show some of these fantastically beautiful, bizarre, and terrifying Tibetan guardian deities and have them emerge as integral to your own spiritual vision. I think this is where the visual representation of spiritual reality has a very different and very threatening razor edge into peoples' consciousnesses, precisely because of its power and its overwhelmingly, undeniably present image, however represented, pixillated, photographed, painted, etc. It seems that the visuality of it encroaches so powerfully onto turf that is already supposedly "visionary" to begin with, but I think walls get built up around visual images maybe even more aggressively and more defensively than around verbal ideology. Alex: Languages tend to isolate as well as to make universal. Imagery definitely has that capacity although it probably can evoke stronger responses. I've been told, "Oh, your Chapel of the Sacred Mirrors should be included in this or that new interfaith center because it's a very eclectic group of work, from Buddhism, Christianity, Hinduism, Judaism, all the various world religions." However some people object to seeing the various deities in bed with each other. Russ: Are we too inclusive? Alex: Or are we that interconnected?! Russ: No rhinoceri allowed in my pantheon! Alex: My work is literal and hard for some people to accept. More minimalist works, like Rothko other mystical abstractionists of the twentieth century, may be more acceptable in the contemporary art world, and even in the interfaith world. Russ: To return again to Venosa, he has gone on record to the effect that his paintings are visions he has brought back with him from his psychedelic experiences. I got the impression that he regards a large part of his responsibility and his passion as an artist to be the reproduction of visionary moments. My guess is you would not say that. Or let me ask it this way, rather than stating it as a position: what is the relationship between your psychedelic experience and the work you end up getting down on canvas or in any other medium? Is it an attempt to reproduce something you've experienced, or is it something generated from a point of view you bring back to reality from your visionary moments? Alex: My work is also about the direct reproduction of intense visions. One's memory gets etched by the "naturally occuring" or the "psychedelic" visionary experience and there is something you don't understand about them, something profoundly disorienting but important in them. My goal is to bring back the state of wonder and amazement as directly as possible. That way, the contemplative viewer can resonate with it and it might reinforce for them an experience that has meaning for them. Russ: Beautiful. I think I told you before that the first time I saw your beautiful painting "Universal Mind Lattice" that vision immediately interfaced and meshed (with a Tupperware like burping seal) with something I had already experienced, never visually. So for me, the interface between my own consciousness and that visual image, you gave a powerful visual reference, and the conjunction between your work and my inchoate internalized cluster of feelings or memories was very powerful, almost overwhelming. I thank you for that. I would have thought though, say with reference to the panels that make up the Chapel of Sacred Mirrors I would have guessed that you didn't have to have had a vision of each and every one of those, but rather that a visionary experience takes on an evolutionary dynamism of its own and generates this evolutionary psycho-spiritual series that constitutes the logical, or rather psycho-logical extension of the experience. Alex: That's very well put. The Sacred Mirrors are unique in my body of work because they are twenty-one paintings that function as one piece. It's a multi-paneled work that investigates what we are as physical and spiritual individuals. The Sacred Mirrors present an integral view of what and who we are, revealing layer after layer of material, biological, socio-political, subtle and spiritual aspects of the self. Because they are paintings, you can stand in front of each one in turn, reflecting on and identifying with the systems that they portray. 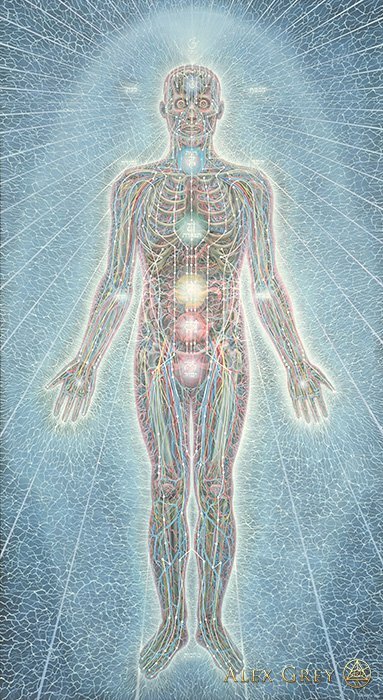 The vision was catalyzed by my wife, Allyson, who suggested that I provide a physical to spiritual map to reawaken the viewers connectedness to these systems. 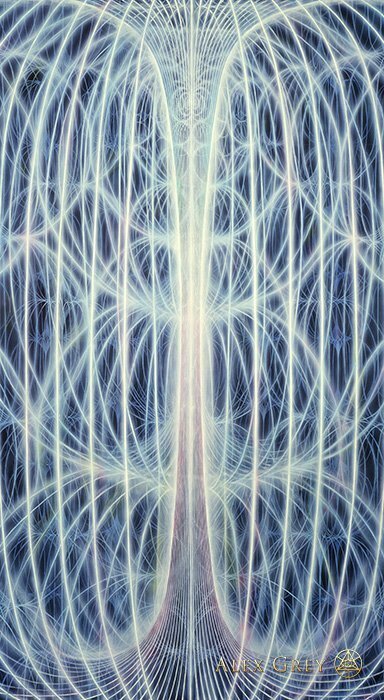 Psychedelic experiences inform certain paintings, like the "Universal Mind Lattice", "Psychic Energy System" and "Spiritual Energy System". The overall vision of the Sacred Mirrors suggests a transpersonal point of view, not tied specifically to one faith, but pointing to the wisdom that runs through each. Huxley's Perennial Philosophy or Huston Smith's Forgotten Truth more eloquently express the spiritual orientation I'm aiming at. Russ: Do you know that old Weather Report album cover from I Sing the Body Electric, from about 1972? Alex: I'd really love to see it, because I'm very inspired by that Whitman line from Leaves of Grass, and by Whitman's transcendental orientation as an artist. In my opinion, that's what American art ought to be about, as much as the pop star, the madman, and the lunatic. Russ: Well, Uncle Walt was a little bit of each, right? Alex: Exactly. He was the poet of the body as well as of the soul. That's the artist's job: to bring spirit and matter together. Russ: Yeah, the poet of man and woman, you and me, of Grass and grass. That's my own orientation. I'm a literature professor, and I work on the so-called Transcendentalists of the nineteenth century as well as on contemporary writers like our pal Tom Robbins, or Thomas Pynchon. I've always been drawn to the visionary element in Whitman and Thoreau. Alex: Yes, I enjoyed living in Boston and walking the same streets as Emerson and William James. Transcendentalism is a rich tradition in this country which I would like to reintroduce in the artworld. Transcendentalists were the first to read all the world mystical traditions and glimpse the outlines of the perennial philosophy. Russ: One of my first dissertation ideas was to be a project on William James and William Carlos Williams, examining the ways in which they use their respective crafts, James in philosophy and Williams in poetics, to explore the all too often marginalized fringes of conscious experience, what we would now call non-ordinary states of consciousness. Not only the validating, but also the revering of fringe experiences. James, of course, tried peyote, but got too nauseous from it. I realized at a certain point that this is what I really care about, the ideas and energies that inspired me to pursue literary studies to begin with. I had also majored in Asian languages in college, and the fit still feels about just right in that I have a connection with the wisdom traditions of the East. I've gotten very excited recently rededicating the work I do to a tradition that has meant so much to me and to very talented artists and writers like yourself. Anyway, I'll send you a color slide of that album cover; I think it will really click with your approach to the electrified human body. As I recall, it resembles some of your work, with its transparent, or, at least, translucent, certainly transcendental vision of the body. Alex: I'd love to see it. I've been doing anatomical drawings since childhood and also spent time working as a medical illustrator. Back in 1980, as I was working on my painting Psychic Energy System, a friend showed me the work of Pavel Tchelitchew. I had seen his painting, Hide and Seek, before in the Museum of Modern Art, but when I saw his whole body of work I was amazed by the similarity of our independent visions. Twenty or thirty years earlier, he had painted a similar vision of luminous anatomy, very deeply resolved and so beautiful. I love his work so much, he is my closest artistic relative. He is a mentor and a forefather. He was really into the occult, alchemical and spiritual qualities that could be manifested through art. But he never, to my knowledge, took any psychedelics. Numerous people have tried to find this out, because his work is very psychedelic but nobody has uncovered any evidence. I spoke with George Tooker who knew Tchelitchew. Tooker and some of the other magical-realist painters did smoke marijuana. They actually grew it themselves. And Tchelitchew had quite a green thumb, but to Tooker's knowledge Tchelitchew never used substances of any kind. He was somewhat of a hypochondriac and afraid of most medicines. Russ: I have a friend, another painter I'm interviewing for this work, named Richard Estell, who now works in Philadelphia. He grew up in rust-belted eastern Ohio, and he attributes and speaks very eloquently about his own psychedelic aesthetic, and yet his works remind me more of Edward Hopper on acid than anything of the obviously visionary, such as we find in your work. These are rust-belt landscapes in which the subject matter is simultaneously incredibly real, sometimes almost banal, and yet also glowingly transcendent. There is often one shade of color, or one element in the painting, which, at first glimpse seem peripheral, but soon emerge as a focul point capable of reorienting your entire vision of the piece. He has a great painting of a chain factory in Ithaca, New York. And what's odd about it is that this factory is being seen and chosen as a subject, but also receiving treatment by someone who has a deep and important relationship with psychedelics. I'm wondering how you understand the spectrum of psychedelic visual art. Who's on the scene these days, and what kind of work is out there? 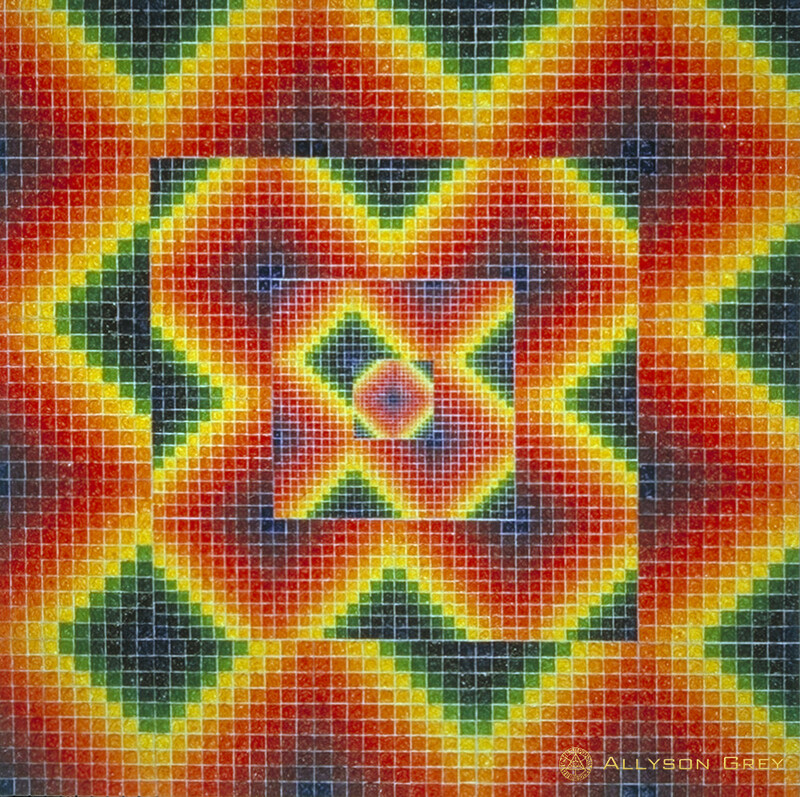 Alex: I know that my wife is my primary influence, and her work is profoundly psychedelic. Her work is like contemporary Tantric abstraction that includes networks of geometric complexity. She created a secret "sacred" alphabet and maps visionary terrain. Her paintings are labor intensive, very complex, and suggestive of infinite reflectivity and geometrically facited crystaline tunnels. Her maniacally organized sacred geometry recalls psychedelic states. Russ: Like some little flower than opens up and reveals its own sacred geometry. What is your wife's name by the way? Russ: Does she plan to publish a book of her work? AG: I've been continually suggesting it, and I know that at some point she would like to. Her work can be found on her website (www.allysongrey.com). She'll be in an upcoming show at the Islip Art Museum called "The Spiritual in Art". My work will be in there, too. Allyson is a really incredible artist and teacher. In our classes she's always very helpful to people, and people who see her work can tell that we're basically making art about the same thing even though the work looks very different. She's working with spectral light and that is also my subject, really - spiritual light. Allyson is one artist working with non-figurative mystical imagery, a tradition as old as Hindu, Buddhist and Jain cosmological diagrams. Also, the aniconic sacred traditions, such as Judaism and Islam, prohibit the graven image and put a great deal more emphasis on the sacred word as portrayed in their astonishing calligraphy and mind blowing patterns of interconnectivity that embellish their temples. There's psychedelic and sacred abstraction, there's visionary figuration and there are many other ways to interpret the mystical experience. Visual art in the rave scene includes sacred geometry, aliens from DMT experiences, all sorts of visions. Some of it may not be of the greatest finish and caliber yet to equal the fantastic realists of Europe, but I'd say that there's tremendous inspiration and visionary contact in this burgeoning wave. There's an occult psychedelic tradition. Alistair Crowley used to take mesculin and no doubt introduced many artists to the experience. There's an excellent tarot deck that was a collaboration between Crowley and his friend the artist, Frieda Harris. Crowley was also an associate of Austin Osmond Spare, a British visionary artist, and amazing draftsman. Jean Houston and Robert Master's book on Psychedelic Art is still one of the best sources of reference for this. The renowned animator who did the color abstraction in the production of Fantasia was evidently modeling his work on his mescaline experiences. Fantasia was out in the late Î30's. Native American paintings from the Peyote church Huichol art from Mexico has brilliantly colored geometric mandalic forms recognizable to any tripper as representing the psychedelic state. Erial is a contemporary psychedelic artist I've seen in Psychedelic Illumination Magazine who I think is modeling the inner worlds of a psychedelic state quite incredibly. Patrick Jacobson, who goes by the name Voke , is an artist working in Baltimore that I think is making some of the most exciting psychedelic art around right now. There are a number of artists taking a more serious and inward tack on the psyche's explored terrains rather than painting what is the fashionable flavor of the month in the art world. They are to what Terence McKenna called the Magellans of consciousness. They are exploring these inner realms and bringing back a feast for our eyes. Russ: Interesting. Alex, do think much or work much in linear modes, such as film? I was thinking Sacred Mirrors would make an astonishing little flip book, and I don't mean to trivialize it by saying so. Alex: Yeah, where one image would morph into the next? Russ: Or even a filmic version in which the morphing could have that seamless visual quality to it that you can never quite get flipping pages. I've been interested in linear representations, such as the way cinema attempts to duplicate psychedelic experiences, as in Altered States, or even Midnight Cowboy, Easy Rider, and those other early acid-ploitation productions like Psych-Out and The Trip. These are often plausible, but ultimately unconvincing cinematic trips that work very hard given their respective levels of technical and special-effects capabilities. Have you thought very much about the differences between cinematic representations and more painterly, "static" images and their respective assaults on the psychedelic experience. Alex: Yes, it's a perplexing problem. I think we can all recall moments of certain films that strike us as deeply psychedelic, referencing the visionary realms in some clever and significant way. Whether the special effect are exploited deeper meaning depends on the film. I have yet to see the ultimate "entheogenic" film that taps the beauty and positive mystical potential of these states. Some of the special effects in the recent Star Wars I evoked the psychedelic state when the irridescent bubble shield formed around the droids. In the film Altered States, special effects computer graphics was used to indicate transformations of characters. I think the movie failed to acknowledge the liberation and bliss that can be experienced, but at least they made a valiant attempt to model these states cinematically and I admire it for that. The film The Matrix points effectively to parallel universes that we can either access or be oblivious of. We are acutely aware of this in the psychedelic experience. Right next door, parted by the filmiest of screens, as James would say, there lies other worlds and other dimensions. Russ: Have you seen that remarkable movie B? Alex: No, but I've heard it's fabulous! Russ: It's one of the most intense and disorienting, disconcerting, and inspiring visual experiments. Jim Jarmush's film Dead Man, without using special effects, is able to represent a hallucinatory and visionary mode. Alex: Stanley Kubrick's 2001 is a classic example, especially in the end sequences. There's so much quiet and space in the film. It's operatic and convincing and still an amazing film. El Topo was another profoundly psychedelic film. Russ: Alex, is there anything more you'd like to say relative to our shared passion of psychedelics? Alex: The psychedelic experience and the spiritual path in general has become so important in motivating the direction of my art work that I've felt it important to create a permanent place where the work can be experienced by the public. Numerous people have been assisting my wife and I in manifesting a Chapel for Sacred Mirrors. It may be affiliated with another organization, or it may be independent. Many works of art donate to this chapel from our personal collection and from other collectors. We are looking for supporters to help us build a space appropriate for the Sacred Mirrors and other sacred art. We refer to this sacred space as Entheon, a place in which to discover the spirit within. Russ: When this happens my family and I would love to assist. Where might you see this happening? Alex: We're in the research and development phase, investigating potential sites. It's a huge challenge. We're looking for an ideal setting that could provide a pilgrimage point. Russ: I'm looking forward to reading your book, and I'm wondering if there's anything you'd like to say about it. 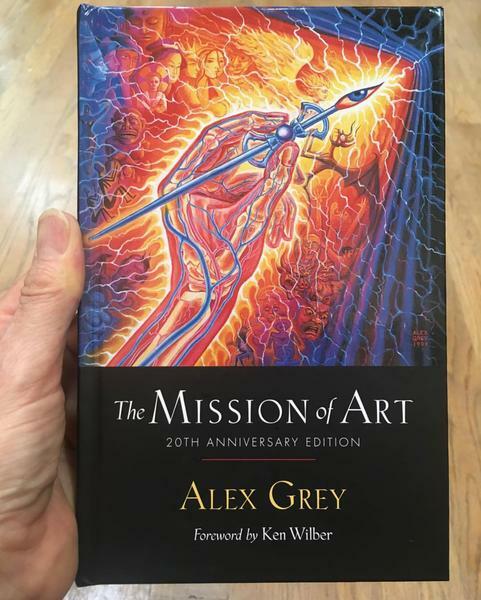 AG: The Mission of Art. It's meant as an inspirational text for artists and for those who have glimpsed art's spiritual power. The book traces the evolution of human consciousness through the history of art, looking at art's mission through time. I write about the development of my own work including my performances and psychedelic experiences. There is a frank examination of the artist's conscience and intensions and the creative process as a spiritual path. I'd like to encourage artists to aim high with their visions in this depleted and cynical world. One thing I'd like to clarify in this interview was elaborated on The Mission of Art. I think it's obvious that entheogens have a place in the artist's toolbox, but they are clearly not for everyone. Some people have suffered through their use and have been further destabilized and even institutionalized. It's dangerous for some people. You are, after all, tinkering with your mind and your entire orientation toward reality. I truly support those who feel that entheogens are not right for them. I advocate freedom for adults to responsibly alter their consciousness if they choose. Russ: When I saw your slides yesterday, of you with half of your hair cut, it brought back a very painful memory of the only real "acid casualty" I know. And like most so-called acid casualties, this could be laid at the door of many substances or many other factors. We were life-long buddies in our little Ohio farm town, our own avant-garde, albeit late comers to the drug scene, and one Halloween night, my friend, John, was loaded up on many substances. It seems that at about 3 in the morning, when the party had pretty much wound down, John was sitting calmly in an easy chair and had a hallucination of his dead grandmother, sitting across the room and giving him a very stern look. He said he felt a shutter, and, for six months afterwards, half of his hair and beard grew, half of his face worked; he was more or less paralyzed, vertically right down the middle, almost like a physical manifestation of schizophrenia. This guy went from being young, vivacious, witty, and artistically talented to a vegetable, a horrible degeneration of a person. Nobody really knows what happened to him, what the constituents of that breakdown were, but he never quite recovered. They blasted him with electro-shock therapy and took away any chance he had of recovering. Alex: It's interesting that my vision and realization of shaving half my hair reminded you of your unfortunate friend. I had never tried entheogens or even marijuana at that time. Just goes to prove that people can go crazy under the influence of normal everyday life. 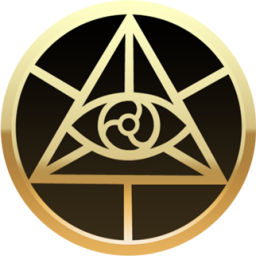 It is interesting that there are recurring motifs in the visionary experience. Heinrich Kluber investigated this and wrote about it in Mescal: The Mechanism of Hallucination. He coined the term "form constants," to describe imagery that recurred in those to whom he had administered mescaline. His subjects reported experiences of the network, the lattice, the filigree, the web, the spiral and the tunnel. Subjects described how they had become a fret-work or how everything was made of a lattice of light that kept transforming. He doesn't really offer an explanation of why these visual and aesthetic constants occured. His job, as a scientist, was to collect the data and catagorize the results. It's nice to know there's a certain iconography of the visionary state. Blake noticed flames with eyes in his sojourns in the visionary realm. The eye, disembodied, connotes consciousness, outside of the physical body. The flame, of course, speaks of illumination and light of some form, but also of passion. We think of the angel as heavenly. It has wings and probably a body of light around it. Dragons are symbolic of earth forces, the ground and the planet's physical being. Many of these archetypal forms are not specific to any one sacred tradition, but the mind recognizes them as evocative of subtle visionary dimensions. Visionary art that's modeled on these form constants becomes a way to confirm the validity of these experiences because viewers who have been there will use the art to help describe their experiences to others. Albert Bierstadt, the 19th century landscape painter went west to discover visions of Yellowstone, the Grand Tetons, and things nobody had ever seen before. When he exhibited his panoramic canvases in New York and Europe people lined up around the block to pay a dime just to see them. Visionary artists voyages inward to become Bierstadt's of subtle mindscapes. Russ: In the conclusion to Walden, Thoreau exhorts his readers to become Lewis and Clarks of their own internal latitudes. Walden ends about as psychedelically as possible. "There is more day to dawn. The sun is but a morning star." You can't beat that! In my book AcidSpeak, which I hope simultaneously suggests the peak of acid's influence, the peak experience of an acid trip, and the way in which acid speaks its own language through us, and we become conduits, or vehicles for some prophetic or some deeper articulation of the interface of our consciousnesses and the cosmos, I explore the way that rock lyrics and other psychedelic discourses use nature as something much larger than a metaphor. One way that it happens is that nature ceases to be metaphor. In fact, throughout rock history, nature has primarily functioned as an impediment: "Ain't no mountain high enough; Ain't no valley low enough; Ain't no river wide enough to keep me from gettin' to you, babe." That sort of thing, that or some fairly facile version of the pathetic fallacy: "Listen to the rhythm of the falling rain, telling me just what a fool I've been." But in psychedelic lyrics, nature transcends mere metaphor and becomes something like memory. It's not just to invent metaphors that Jimi Hendrix says "I'm standing next to a mountain; chop it down with the edge of my hand," and that Donovan says "Thrown like a star in my vast sleep; I opened my eyes to take a peak; To find that I was by the Sea; Gazing with Tranquility,". They're talking about an experience, a profound simulacrum between human nature and its natural environment. To me this either demetaphorizes, or perhaps supercharges nature, so that we find ourselves part of some much larger network or constellation which nature is no longer available as metaphor, because we're no longer separate from it and no longer have some imperious human perspective from which we look down on nature. It's more like kin, or distant relative, or memory, prophecy of some monumental fate we share with the world. Alex: During his final months, Hendrix talked of the "sky church,"the huge outdoor concerts, like Woodstock and Isle of Wight. He shamanically, sonically waved his freak flag to the mandala of the stained glass sky. I think the sky spoke back to Jimi and through him in a deep relationship. His incredible powers of invention and understanding of world music could be synthesised into one riff. Russ: You know, when Venosa was talking yesterday about trying to recover that angelic visitation through his painting, I though about Jimi Hendrix, who often had soundscapes emerge to him, not only during psychedelic experiences, but anytime. Much of his compositional and innovative technological thing was trying to reproduce sounds adequate to those internal sounds he alone could hear. He wanted to share them. Hendrix frequently resorted to color imagery to communicate the quest he was on. Of course he could approach these realms both through his voice and his guitar, so he lived out the ultimate synergy of human being and technology that I posit as the hallmark of psychedelic music. Alex, have you ever seen the aurora borealis? Alex: No, I've only seen pictures of them. Russ: I took my family to Finland a while ago on a Fulbright Fellowship to teach, but the real reason I went was to experience the northern lights as far north as possible, and in as appropriate an environment as possible. Finland really fit the bill. My family and I based a trip to northern Lapland, about three hundred miles north of the Arctic Circle, as far north as Finn Air would fly us on a University of Alaska forecast for that weekend's auroral activity. The experience so overwhelmed me, I plan to do everything in my power to return there as often, or for as long a period as possible. I dream of retiring to Lapland. The aurora is basically cosmic debris, metallic debris pulsed out by solar storms and flares. This stuff gets caught in the channels of the earth's magnetic poles and carried toward each pole. So you get these magnetic tendons along which the debris rides like waves to the pole. We walked a couple miles away from our little resort, and we watched the lights for about four hours. They looked like a cosmic lace curtain rippling in a gentle breeze, and as different metallic content entered the pull, the colors varied with the different metals. At one point, the two channels we could see, both of which ranged in color from lime green to glowing white started filling up with purples, as though you were filling a glass with purple liquid. They became more like rainbows, and then something happened causing them to interact and start swirling together, no longer two channels but a tornadic whirl of colors. We literally fell to the snow in amazement and found ourselves gazing up at this cosmic, technicolor tornado. It felt sexual, cinematic, spiritual, spiraling into this magical point of confluence. We could hear the crowd of Japanese photographers a mile or so down the road screaming in ecstasy at this phenomenon, and my children, who were 15 and 11 at the time, were so shattered by this, we all just lay down in the Arctic snow. Alex, this has been a real pleasure and a real privilege. Thanks very much for your time. Alex: I had an excellent time; thank you.